Nowadays, a lot of developers around the world are tend to use Docker containers as a unified application packaging and deployment solution. Such applications can be developed locally and built as containers for being delivered to the cloud infrastructure. 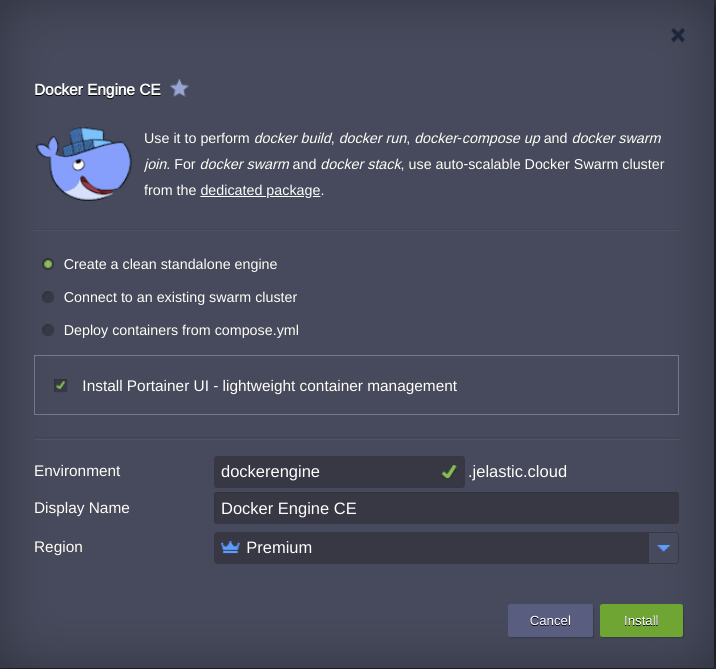 Thus, today we are going to highlight the key points of the native Docker support integration within Jelastic PaaS – in particular, we’ll pay attention to the dedicated Jelastic-adapted Docker Engine solution. It allows to set up a new Docker instance in just several clicks, running it as either a separate standalone node or a part of an already existing swarm cluster. So, let’s glimpse the key specifics of the automated Docker Engine deployment and the options it could be run with. Upon installing the package, the platform creates an isolated worker node with the Docker Community Edition (CE) engine being run inside, which is someway similar to launching it within a separate virtual machine (VM). Herewith, the Platform additionally provides automatic vertical scaling for all such worker nodes, allowing to escape worrying about right-sized resource limits whilst anyway paying only for the actually used capacities. In addition, if expecting that your application would experience heavy steady load or occasional load spikes, you could scale the created node horizontally via topology wizard in advance, or configure a set of auto-scaling triggers to automatically increase/decrease the number of workers. 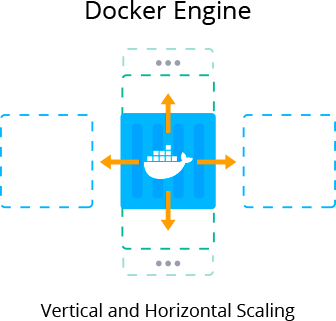 At the same time, due to the smooth integration of Docker application containers and Virtuozzo system containers, developers are able to operate with dockerized applications inside the cloud similar to the natively assumed workflows, whilst still benefiting on such inherent Platform features as a convenient graphic user interface, auto-scaling and pay-per-use pricing, joint collaboration on a project and multi-cloud infrastructure with its location and infrastructure versatility. The chosen Platform should run Jelastic of 5.2 version or later and contain environment region(s) with the native Docker support enabled (their presence and names could be found within the same-named column of the Jelastic Hosting Providers list). Next, let’s consider the modes that your Docker Engine server could be run with depending on your goals and reveal specific deployment options for each of them. Finally, we’ve got to the point of our review – actual installation of the Jelastic-managed Docker Engine solution. Due to being delivered through Jelastic Marketplace, its deployment represents an extremely simple process, which, we believe, is already familiar for the majority of our readers. Nevertheless, let’s consider the implied steps in short just for the case, examining the appropriate deployment options at once. 1. Log into the dashboard and click the Marketplace button at the top panel. Within the opened frame, search for the Docker Engine package, hover over it and click Install to continue. 2. A confirmation dialog will appear in a moment. Note: Pay attention that external IP addresses are available for billing users only, thus you need to upgrade your account to the paid version beforehand. Click Install and wait a few minutes for Jelastic to automatically perform all the required actions, i.e. to set up a new environment with a container, built upon the appropriate specifically adjusted Jelastic-managed stack template, install the Docker Engine itself and, depending on the option chosen, deploy the provided image. Once all these tasks are completed, your dockerized instance is already running and ready to work with, whilst you’ll be shown the appropriate dashboard notification with administrator credentials for its management (also duplicated to your account email). At this point, we believe, you’d like to ‘play’ with your Docker Engine server in the cloud and test how all the inherent Jelastic features are applied here, thus we’ll give you some time to try it out. And the next time we are going to consider the ways you could connect to this instance and dive into some specifics of the provisioned deployment modes. Thus, keep following our blog and come back in a few days to find out more interesting details on Docker Engine hosting within Jelastic Cloud!